If you mention to your team that you are planning some team-building activities, you might face some groans and eye-rolling as they anticipate silly games and awkward activities. Unfortunately, team building often gets a bad rap, but it doesn’t have to that way. At La Vida Laguna we’ve created some fun group activities that everyone in your group will love. At La Vida Laguna, we got our start organizing ocean kayaking adventures and this remains one of our most popular (and fun) group activities. No experience is required, and we launch and land at a gentle little location without waves. As we paddle along in a protected marine reserve, you’ll enjoy a unique view of the Laguna Beach coastline and perhaps encounter a few sea lions, dolphins or even whales at play in the Pacific Ocean. Southern California is the Mecca of stand-up paddleboarding, and it’s a fantastic low-impact activity. We guide you along in gentle waters and share some facts about the Laguna Beach’s abundant flora and fauna as you immerse your senses in the sights, sounds and the scent of the sea. A day at the beach is always a good idea, and it’s even more exciting when you get to let down your hair a bit and play some games. We’ve designed a unique Shipwrecked experience where groups work to build shelter and gather food in a “Survivor”-esque game that throws a few challenges at you along the way. We also have a unique Castaway adventure, where we organize your team into groups and they work together to build a worthy sea-faring (or rather swimming pool-faring, as we host this event at nearby resort hotels) craft. Teams design, build and name their vessel and then compete in a race to see whose boat will win. We can design a day of Beach Olympics at local beaches, parks or even on hotel grounds if needed. The games are competitive, but fun and it’s not all about physical strength. We can design Olympics-style events for groups as small as 12 and as large as 200, and there are plenty of fun group activities from which to choose. This can be a great way for people to get to know each other. You can mix up people from different departments or offices and they’ll work together enjoying the spirit of competition and day away from the office in the great outdoors. Did you know that Laguna Beach has 25,000 acres of protected coastal wilderness? The wilderness area is dotted by a series of trails that allow you to get up close and personal with our unique eco-system and enjoys unparalleled vistas of the Pacific as well as the Saddleback Mountains. We lead hikes throughout this untamed wilderness, providing a bit of information about the history of the area, as well as the abundant Coastal Sage Scrub and some of our local fauna. We also offer hiking with a transformative twist, if you like. Our Mindful Hiking adventures are one-of-a-kind, and as you walk along the trail, we teach you how to become more present with your surroundings and each breath you take. This is literally a moving meditation that induces calm and well-being, and teaches one how to make the journey the destination. If you are searching for some fun group activities that get the blood pumping, why not have us set up a bike tour for your group? We have several different options, and also choose the safest routes. In fact, we have been pioneers in the development of safe biking routes. Your options include everything from a Crystal Cove Bluff Ride to a Laguna Beach Back Roads Tour. We also offer a Dana Point to San Clemente ride, a Dana Point to historic San Juan Capistrano ride, and treks through Newport Beach. 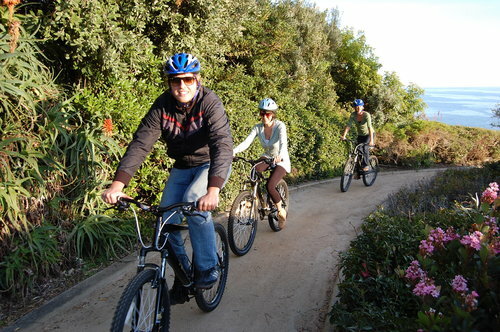 We can even lead you on a ride from Huntington Beach to Newport Strand or set up a mountain biking adventure in Aliso and Wood Canyons Park if you team loves biking and is up for a challenge. 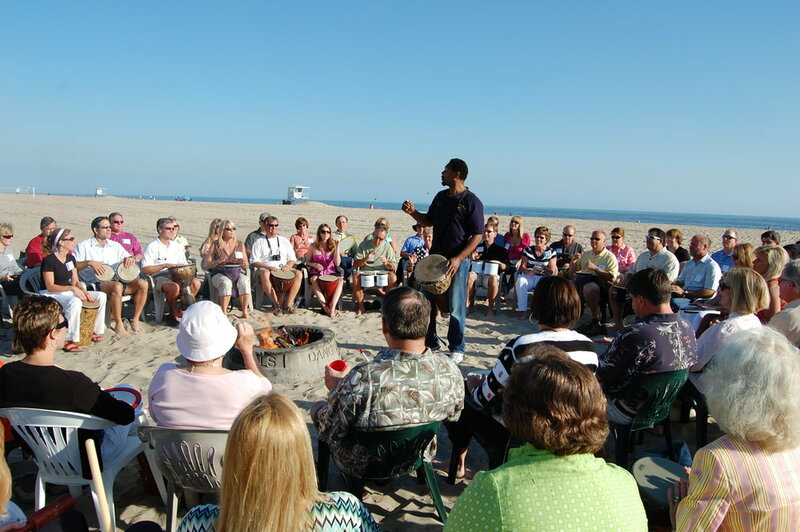 Laguna Beach is known throughout the world as an amazing tourist destination, and we have created some fun group activities that allow you to enjoy some time in this haven by the sea. We have two historical walking tours where you’ll enjoy some great architecture while learning all about Laguna’s past, including a few notorious incidents and residents. Additionally, we also arrange treasure hunts, which can be a great way for your team to enjoy a day in Laguna. Of course, not every group is up for an adventure that requires some physical effort. Sometimes it’s nice to enjoy a trip on a luxury coach and see some local sites. Even if you have a group of locals, they’ll still enjoy a trip to Orange County’s only vineyard for our Wine & Wilderness Tour or perhaps sampling some of the area’s best beers on our Microbrew Hop. If you have a bunch of foodies in your midst, our Ethnic Foods Tour will take you to Little Saigon and Little Arabia as well as trek where you can enjoy some of Santa Ana’s best Mexican cuisine. We also offer an Art & Architecture Tour where your group can tour historic Santa Ana, Anaheim and Orange. Ok, ok, we know what you are thinking. Drumming is one of those metaphysical activities dreamed up by a bunch of hippies with flowing hair and love beads. But, it’s not. Drumming is ancient, practiced by cultures around the globe for thousands of years. Drumming helps people bond, but that’s not all. Studies have shown that drumming reduces stress and anxiety and can even improve focus and boost your immune system. When you gather a group together and they work in tandem to create music something truly magical occurs. If some of your team members need a cocktail (or two) to get them in the spirit, we can arrange that, as well, but you will be amazed by this activity. Group drumming is one of our most popular group activities, and it’s the perfect way to kick off a conference or wind down after a busy day of meetings. When it comes to our fun group activities, this is just the tip of the iceberg. Take a look around our website, and you’ll discover even more transformative group adventures that your team might love or give us a call at any time to discuss the best possible excursions for your team.